This is a page about SUGOROKU(Japanese board game) Party (only in Japanese) for the Sumida Hokusai Museum. 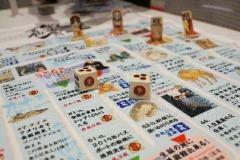 Enjoy playing Hokusai SUGOROKU surpervised by us, which is like the game of life ver.Hokusai. Player can learn Hokusai’s life through playing the game. Children can also enjoy Japanese traditional game such as shooting game. Museum’s official comedian Katsushika Futome/Gyorome join in this party!